Mobile art pioneers from around the world will show off their latest creations at the LA Mobile Arts Festival. The event will be Santa Monica Art Studios’ first-ever mobile arts exhibition showcasing nine days of mobile artistry from the heart of the West Coast’s contemporary art scene. The Call for Entries is open from now to July 15, 2012. Submission and sponsorship details can be found on the LA-MAF website. Santa Monica Art Studios is a major mecca for contemporary art and design in the Los Angeles area. This vast, historic airplane hangar was converted to a modern-day artists’ colony in 2003. Under its soaring roofline, artists of every persuasion come to share, create, and sell their works in studio and exhibition spaces. 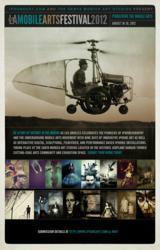 LA Mobile Arts Festival 2012 will be a fusion of art and technology, exhibited in Arena 1 at SMAS – 2,400 sq. ft. of prime exhibition space that shows off cutting edge artworks from curators across the globe. Here, early aviation pioneers once roamed the hanger. What better place to champion today’s passionate iPhoneographers and mobile artists as this underground movement takes off worldwide. What better city than Los Angeles – home to a panoply of world class visual effects and digital artists, and to Silicone Beach, a new hub for iPhoneography and mobile art related tech developers. “We welcome submissions for all the mobile arts—photography, sound- and video-based works, sculptural and performance art pieces,” said Daria Polichetti, co-founder of IPA. “We are thinking big – and encourage artists to investigate ways of going beyond traditional presentation methods. We are currently accepting proposals and will also be reaching out to artists with ideas for solo and collaborative installations. We are looking at new printing techniques, three-dimensional installations, environmental design and much more. Funds will be made available for the projects we are most excited about,” she said. Some of iPhoneArt.com’s award winning artists who will be taking part in this year’s festival can be seen on the2011 IPA Mobile Grant page. Best of all, many of the festival’s featured artists will be able to take advantage of IPA’s upcoming iPrints Store, enabling them to sell exhibit images as well as works from their larger portfolios, not just to the Los Angeles crowd, but around the globe. The iPrints Store is the beginning of an innovative and far-reaching sales platform for mobile artists. It is currently in beta testing, and will be launching soon. Thanks for posting! This looks great!